Probably you would not run into another person’s office screaming simply because you don’t have the time. Some people, who will remain unnamed, send emails that have the same effect: they create a lot of noise and annoyance but don’t really get you anywhere. Lucky for all of us here you have easy email etiquette in one short blog post. Getting this down is absolutely essential if you don’t want to be thought of as annoying! Far be it from Mixonian Institute to go around criticizing people, but we did receive a message from a fan in London, a creative genius cartoonist, asking for our help in improving the international email exchange. These 5 tips are absolutely non-negotiable when you’re not a close personal friend of the person you’re writing and they’re certainly preferable to have even when writing your childhood BFF. 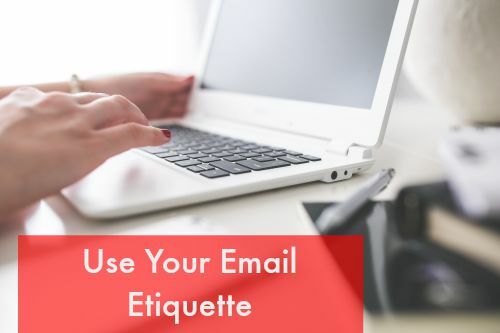 Email Etiquette Checklist to Help You Get a Positive Response… or at least a response. 1. Subject line tells why the recipient should read it. Before you put your fingers on the keyboard, get crystal clear on what you want to happen as a result of this message. Here is a brief excerpt from Ms Creative Genius’ message to MI. We receive so many emails from business professionals in high-level positions that do not include a salutation. No “Dear Creative Genius,” no “Dear Company Name,” just a dive-right-in-there-without-context-or-framework. It is amazing how much it demoralises (demoralizes) our staff when this happens. Our first question is, there are 3 of us, to whom is this request addressed? Especially in cases where you are not this person’s BFF, you may actually be sending the message to the wrong person. That person is morely likely to forward the message to the right person if you greet her first. After the first email in a chain, you don’t have to continue with “Hi, Allan,” but it never hurts. 3. For heaven’s sake, get the spelling correct. Seriously, if you don’t take the time to find out how the person spells his name, you don’t deserve a positive response, or any response at all. You’re the one being rude and probably you should just stop sending emails. Is it Laura, Lora, Lauren, Laurie or Lori? Is it Kristin, Christinne, Kristina? Is it Jon, John, Jean or Jonathan? If you don’t know, call the person. Then at least on the phone they’re less likely to realize that you don’t really know their name. Spell check the rest of the message! 4. Use a full signature. Get it automated, of course. But people need to know your full name, job title, name of your company, postal address and phone number. What if this person wants to call you and offer you some business? If you don’t know each other personally, how in the heck is the recipient supposed to know who you are and which company you represent? Even if you’re emailing from your phone, make sure you’ve set it up to send out an automated signature.No one has time to play Sherlock! Take the time to edit out extraneous information (I mean what doesn’t serve the purpose of your message)and organize well your thoughts. Use white space, bullets and/or numbering to make it easy to read. Bold key words. If you’re too busy to send a well thought-out email with a coherent, contextualized message, then we’re far too busy to respond. What are your best email etiquette tips? Let us know by commenting below.